As a transplanted Minnesotan, I have been listening to Garrison Keillor for a long time. Even while living in Minnesota I listened to his radio program, A Prairie Home Companion. I remember him in the 1970s as this wild-haired radio host who loved folk music, sensible people, and subtle humor. As he gained respectability and developed Prairie Home Companion, he became THE topic of discussion among my friends. Musicians, poets, writers, people you’d never hear of on your own, became part of our lives as a result of the show. In the age before television (which pre-dates me, thank you very much), people would gather around the radio and listen to their favorite programs. Decades later, even with television and the internet. people still do that to listen to his show. He also had a great radio program where he was the DJ in the morning on the local public radio station. His co-host was Tom Keith, who does sound effects for PHC. That’s what I listened to on the way to work. After I moved to San Diego, I still listened to the program when I could. Sometimes my wife and I would get together with friends on a sailboat late Saturday afternoons and listen. Seemed odd to listen to tales of winter while bobbing on San Diego Bay in December, but it was fun. There was something about his knowledge of human nature, his disdain for pompous politicians, his love/hate relationship with people of faith, that made him seem like a prophet. He had the magic of both Will Rogers and Mark Twain. His strength, of course, is as a storyteller. That got me to thinking about bringing him to the campus where I teach, Point Loma Nazarene University, as part of our annual Writer’s Symposium By The Sea. I wrote to him, appealing to our shared Minnesota roots. No luck. I tried using the influence of mutual friends. Nothing. After hearing the comedian and now Senator Al Franken on the show, I wrote again, telling Keillor that Franken and I knew each other in high school (which is true). I had even been involved in some of Franken’s wacky stunts in high school theatrical productions. Still nothing. I tried the religion angle. Nope. Nothing. Zilch. Nada. This went on for TEN YEARS! Then there was a breakthrough. Somewhere in late 2008, early 2009, my appeal seemed to get his attention. His people called my people. Actually, I am my own people, so they called me. He was interested, they said. Within days, we had a deal, a date and euphoria. The date was set for September, 2009. All of the stars aligned for this. Our local media got on board, my school caught the vision, the public scooped up the tickets within days and the event quickly sold out. 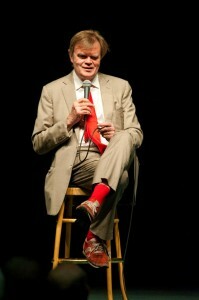 A few days before this largest event of my life, Garrison Keillor had a stroke. Show cancelled. Of course we were all concerned about his health. He’s a national treasure. He was back doing his radio program within a couple weeks, but doctors didn’t want him to fly — especially not a long distance, like, say, California — for a while. So we waited. Last night, March 4, 2010, he made it. I picked him up at the airport, and we went to the campus to walk around a bit. I told him a little bit of history about the former inhabitants of Point Loma, the Theosophical Society, about how the US Navy moved in during World War II to defend against a possible attack like Pearl Harbor. I told him who the Nazarenes were, how they broke off from the Methodists in the early 1900s, and started this university, which moved to this location from Pasadena in 1973. He asked very few questions. He’s pretty quiet. Stories about his being very shy seemed accurate. We walked around campus for about an hour, then he went to his hotel for the rest of the afternoon. During his performance last night, he unwound a story about Nazarenes and Theosophists that had the audience in tears with laughter. He started by saying he wanted to find out who the Nazarenes in the audience were, and began singing the Doxology. Right from the start we were singing in four-part harmony. It got wackier and wackier from there. He used almost everything I had told him just a few hours earlier. He also quoted sonnets, the entire Edgar Allen Poe poem Annabel Lee, and sang songs about love, as well as one hoping there was a God. And after about and hour and forty-five minutes of this one-man variety show, he wrapped it up by leading the packed-house choir in the spiritual song Amen. Then he was gone. The spontaneous, instant standing ovation that erupted was breathtaking. For just under two hours he gave this recession-weary audience a vacation, and made them love life again. Somebody gets it, we thought. Somebody realizes that in the midst of unemployment, big banks ruling the world, people dropping bombs or strapping them to their chests, and conflicted inner hearts, there is hope and love and beauty. And humor. Most important of all. I LOVE GARRISON! I try to catch his show whenever I can. As a weird coincidence, I am actually wearing my PHC short-sleeve button down today. It’s blue and has all the logos for the fictitional sponsors on it – Powdermilk Biscuits etc. I missed the show due to cash flow but glad to hear he brought the house down! 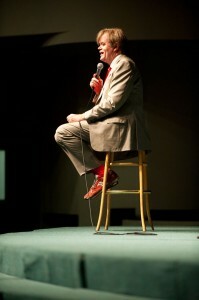 I will enjoy his show even more knowing that he brought so much joy to my alma mater. Yup — showed artistry at all levels. Glad you’re a fan!